There's no question that our state-of-the-art technology has improved the dental experience for many of our patients. We use technology to identify problems and then share the results with you, so you understand our concerns and recommendations. Certain procedures, like restorations and root canals, are streamlined because of technology. Please take a moment to learn about our technology and how it can help you! In the past, our only option for taking impressions included a messy liquid smeared in a large metal tray. Impressions taken this way are not always accurate and, worse yet, they are often uncomfortable for the patient. Our state-of-the-art digital scanner not only eliminates this unpleasant process but also gives us a much more precise representation of your teeth. The scanner produces a digital map that our doctors use to create 3-D images of your mouth. During the process of scanning your mouth, you can view the images as they appear on the monitor. This technology allows us to produce a highly accurate and detailed model of your teeth, which is then used to plan treatment for dental restorations like same-day crowns, bridges, inlays, and onlays. We are pleased to offer the convenience of Planmeca FIT CAD/CAM technology. This state-of-the-art dental imaging system allows our doctors to restore decayed teeth and place crowns, inlays, onlays, and some bridges right here in our office in just a single visit. With a same-day crown, we prepare your tooth in the usual way, but then we create your customized restoration here in our office while you wait. 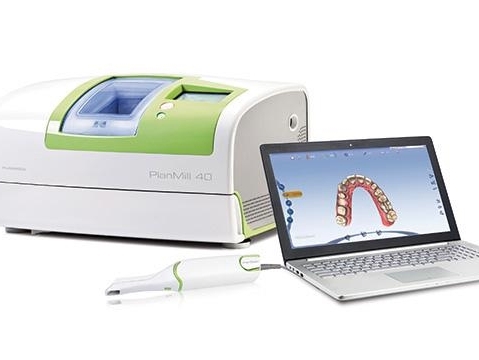 We use our digital scanner to take impressions, so you don’t have to worry about going through the messy and uncomfortable process of sitting with a mouthful of pink paste. Since we can complete the entire process here at Garden Springs Dental, you don’t have to wait for weeks for an outside lab to do the work. Visual exams by your dentist are an essential part of your routine dental care. However, the problem with visual exams is they don't let us see what's happening inside your tooth or gum tissue. At Garden Springs Dental, we offer the convenience of panoramic digital x-rays to detect problems when they are small, long before they cause discomfort. As part of planning your treatment, we use panoramic digital x-rays to take highly detailed, two-dimensional images that include the teeth, upper and lower jaws, and surrounding structures and tissues in just one x-ray. Digital panoramic x-rays produce detailed pictures and significantly reduces your exposure to radiation. Estimates say that digital x-rays reduce your exposure by as much as 80%! Dental issues commonly start in places that can't be seen with a visual exam – like in between the teeth or under the gum tissue. Using digital x-ray technology, we can find these problems when they are small, long before they cause discomfort. Images produced by digital x-rays are highly detailed, and we can project them directly on our chairside monitors so you see the same details we see. Our doctors can enhance the image, make it larger or smaller, and even rotate it so you can easily see the problem and why we recommend treatment. Your safety is a significant concern, and we choose digital x-rays because they significantly reduce radiation exposure. Some estimates say that exposure with digital x-rays is about 80% less than with traditional films. Your x-rays can be stored digitally in your patient record as well, making it easy for us to retrieve them quickly when necessary. We can also send the images to specialists and insurance providers as needed. And because no chemicals are required to process digital images, they are better for the environment! Visual exams are the foundation for diagnosing many dental problems, but today we use intraoral cameras to go one step further. Intra-oral camera images make it possible for you to be an active part of your treatment planning. The camera is about the size of a pen and allows you to see the same details we see since we can display and enlarge the images on the monitor in your treatment suite! We want you to be involved in your treatment, and intraoral cameras are an easy and efficient way to include you in the process. When you can see the problem for yourself, we know you will be able to make a more confident decision about your treatment. Our goal is to provide you with compassionate care to ensure that you have the most comfortable and stress-free treatment possible. If you have anxiety about dentistry, though, you may find it difficult to come in and see us often enough to keep up with your dental needs. Relaxation with nitrous oxide has helped many people calm down, so they feel good about keeping up with routine dental care. Nitrous oxide is a colorless, odorless gas that is mixed with oxygen and delivered by a small nasal mask. You just have to sit back and let the calming effect wash over you. People commonly refer to nitrous as laughing gas, but you can forget any images you have of laughing uncontrollably during your treatment! We carefully monitor the mix of oxygen and nitrous to ensure that the levels are just enough to provide you with short-term relaxation. There's no need to worry about missing time from work or school because as soon as we turn off the gas, any effects you feel quickly dissipate. You don't need a driver, and you will be able to return immediately to your usual daily routine after your appointment. Treatment with lasers benefits people who are anxious about dental procedures because it’s faster, safer, and more conservative than traditional dental techniques. For more complex cases of periodontal disease, soft tissue laser treatment is comfortable and efficient. Using dental lasers to kill bacteria is an advanced approach for treating periodontal disease. Since lasers are less invasive than traditional methods, you will experience faster healing times and an easier recovery. Laser dentistry can also relieve the pain of canker sores and aphthous ulcers as well as remove oral growths.